If you need factory-quality assemblies on the job site, there's no better hydraulic hose crimper than Gates new, state-of-art MobileCrimp 4-20. Mobile Crimp 4-20 is light, versatile, yet powerful enough to crimp hose up to 1-1/4" four-spiral hydraulic hose. Designed based on recommendations from those who know crimping best - - people who do it for a living. It's light, easy to use, versatile . . . and affordable. Can be powered by hand, 12 vdc, air-hydraulic or electric pump. Get one hose crimper for all your needs - - the MobileCrimp 4-20 crimps the full range of Gates hydraulic hoses, everything from low-pressure return line to high-pressure four-spiral hose. 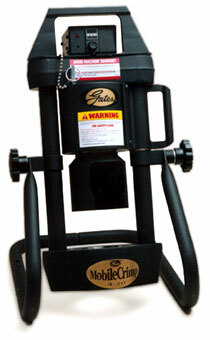 Portable (approximately 55 pounds); can be mounted permanently on a service vehicle or work bench, if desired. Bottom-loading feature provides clear view of crimping area. Ability to crimp in various positions for added versatility on the job site. Swing-away cylinder provides easy die and assembly loading and unloading. Unique die design holds coupling in crimping position to free hands and help prevent accidents. Light and buzzer alert the operator that crimp is complete (not available on positive stop). Works with most 10,000 psi pumps. Controller option can be upgraded to a variable style as your crimping needs change.